Last year dinosaur survival game The Stomping Land made $114,060 on Kickstarter, and a few months ago it hit Steam Early Access. The developer claimed there'd be weekly updates, new features, and well, anything to round out a barebones experience. Then they disappeared. Until now. In multiple places developer SuperCrit, headed up by Alex "Jig" Fundora, promised frequent updates once the project picked up Steam on Early Access. On the game's Steam page, the first note reads: "It has had a year of progress and will continue to undergo production with frequent updates until the end of 2015." Meanwhile on Twitter SuperCrit specifically mentioned weekly updates as a key part of the plan. And yet, there's been nary a meaningful peep since June. Buyers and backers are, understandably, rather upset. More than a thousand have even signed a Change.org petition for refunds. Officially, the story is that developer SuperCrit had to deal with some "personal issues" back in June (shortly after the launch of the Early Access version) but it's now the beginning of August—quite a long time since they declared themselves "back and ready to stomp." Meanwhile SuperCrit's website is busted and they let their contract with their community/public relations person expire way back in May. The contractor, Lee Fisk, continued helping out until July because he "wanted to see the game succeed," but eventually got fed up and decided to stop with his stomping. He felt like he was "stringing the community along." Now for the good news. To hear main developer Alex "Jig" Fundora tell it, The Stomping Land has not been abandoned, left to rot like mouldy bones miles below the earth's surface. Right now he's working on porting the whole game to a better engine, Unreal Engine 4, he told Kotaku. "It has been quiet in The Stomping Land community but that is certainly not the case behind the scenes! The game is being moved to Unreal Engine 4 to take advantage of technical and creative opportunities, and while the game was so early in development, I didn't want to keep working for years with a game engine (UDK) that had officially lost support by Epic." Excellent! So there you have it: The Stomping Land is still alive. It hasn't been abandoned, as many gamers feared. However, I found it odd that Jig specifically said the community has been "quiet" since countless Steam, Reddit, and Stomping Land forum posts have been saying (oftentimes VERY LOUDLY) the direct opposite for weeks, so I asked him about the complete lack of communication. He hasn't replied since. It's been almost three days. Now, longtime supporters say this isn't entirely unusual for Jig. 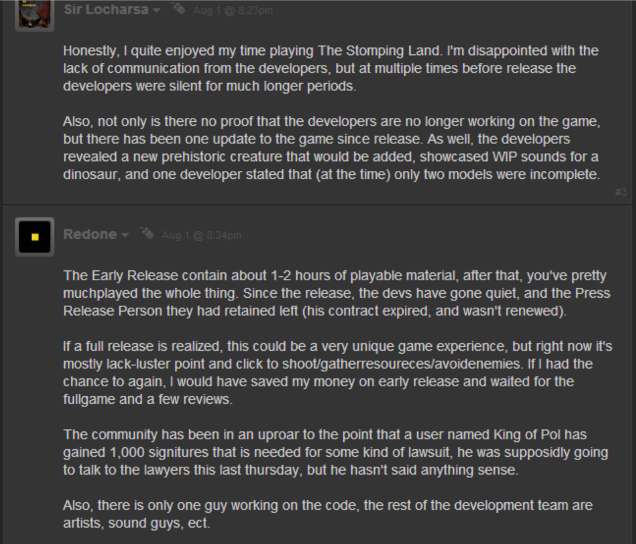 He disappeared a couple times before Stomping Land hit Steam Early Access, many claim. He was out of the gigantic, T-Rex-like public eye for more than a month. People who've worked with him on The Stomping Land (though not on the main dev team) contacted me to corroborate that information. This isn't a cut-and-run, they said. It's a communication breakdown. Given that Jig told me what he's doing with the game right now, that is—assuming he's telling the truth—likely the case this time too. But that doesn't change the fact that such a lengthy period of radio silence following promises of regular updates is an extremely poor way to handle, well, anything. It's stirred the community into an enraged panic, and let's not forget that many of these community members helped push the game way, way, way past a $20,000 Kickstarter goal. Others went on good faith in making a Steam Early Access purchase, and why not? The page is littered with promising plans and, crucially, notes about "frequent updates" in order to realise them. A lack of transparency seems to be the problem here. What's going on? Why did they let go of Fisk? Are personal issues still getting in the way of development? Jig answered one of my questions, but so many of the community's still remain unanswered. It's great that Jig is still plugging away on his prehistoric baby, but when a developer says they're gonna do something and they've already accepted a hefty heap of money, it becomes a whole different ballgame. Silence has clearly eroded trust here, and when game makers are asking people to give them money before a game is done, trust is the currency they live and die by. Gamers don't just pour money into this stuff, either. Passion is the other key ingredient, and it's a volatile one indeed. Treat it carelessly and it will blow up in your face. Dedicated fans deserve better. Or at the very least, they deserve something for their troubles. As in all cases concerning a lack of communication and transparency, I urge caution here—especially since money is on the line. Jig seems to still be working hard, but Stomping Land is very unfinished and such a big lapse in communication/updates—whether for a good cause or not—is cause for concern. If you're interested in the game (dinosaur hunting/survival? rad!) then by all means watch and wait, but probably keep a cork in your piggy bank for now. I'm still holding out hope that Jig will reply to me or finally re-open lines of communication with the community. I'll update this post when/if that happens. Here's hoping, and until then happy hunting.